Punjab Royals’ 2018 national championships silver medallist Anita upset Asian Championships gold medallist Navjot Kaur in the women’s 62kg category to clinch the tie against UP Dangal and move to top of the table in the Pro Wrestling League (PWL) Season 4 currently underway at the Gautam Buddha University Indoor Stadium in Greater Noida on Monday. Greater Noida, January 28, 2019: Punjab Royals’ 2018 national championships silver medallist Anita upset Asian Championships gold medallist Navjot Kaur in the women’s 62kg category to clinch the tie against UP Dangal and move to top of the table in the Pro Wrestling League (PWL) Season 4 currently underway at the Gautam Buddha University Indoor Stadium in Greater Noida on Monday. UP’s Jitender clinched the last bout of the evening against Punjab’s Amit Dhanker 10-9 in the men’s 74kg category in a closely fought encounter to ensure his team will make it to the last four stages on technical superiority. Punjab with eight points after this win moves to the top of the table and will again take on fourth-placed UP Dangal in the semis while second-placed Haryana Hammers will lock horns with third-placed Delhi Sultans in the other semi-final. 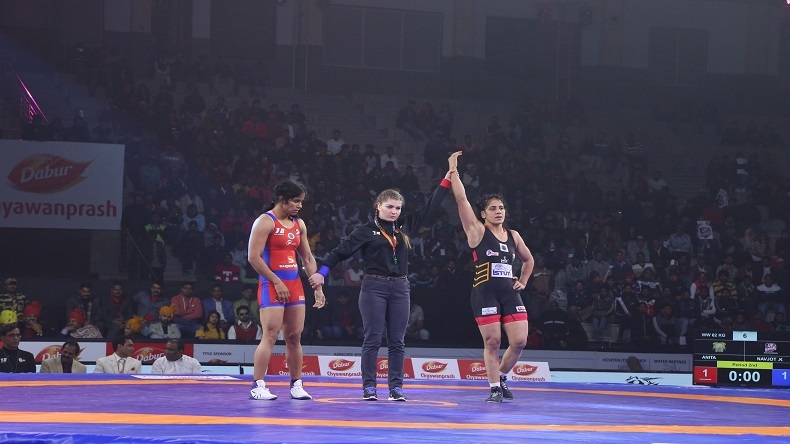 The Haryana cop Anita, who is making a comeback to wrestling after childbirth, gave her all against the technically superior Navjot to win the bout by scoring the last point and clinch the tie for the defending champions. Earlier, UP Dangal’s 2018 Asian Games silver medalist Giorgi Sakandelidze came from behind to get the better of Punjab Royals’ 2018 Commonwealth Games silver medalist Korey Jarvis 4-2 in the men’s 125kg superheavyweight category to help his team take an early lead. The fearless Anju came out strongly and even took a four-point lead with a takedown against world champion Vanesa Kaladzinskaya of UP Dangal in the women’s 53kg category. But the Belarus wrestler’s experience helped her come back for a 12-6 win and put the UP Dangal’s 2-0 ahead in the tie. Padmashree and world No. 1 Bajrang Punia got the defending champions Punjab Royals back into the game with a convincing 7-0 win over an aggressive Pankaj Rana of UP Dangal in the men’s 65kg category. The 2017 Asian Championships silver medallist and UP Dangal’s giant-killer Sarita couldn’t recreate the magic of her last few bouts and went down to the 2018 European championships silver medallist Mimi Hristova in the women’s 57kg category to bring Punjab Royals level to 2-2 after four bouts. Punjab Royals sneaked ahead 3-2 in the tie when the 2012 Olympics bronze medalist Dato Magarisvili got the better of UP Dangal’s 2018 European U23 silver medalist Irakli Misituri 5-0 in the men’s 86kg category. 125kgM: Giorgi Sakandelidze (UP Dangal) beat Korey Jarvis (Punjab Royals). 53kgF: Vanesa Kaladzinskaya (UP Dangal) beat Anju (Punjab Royals). 65kgM: Pankaj Rana (UP Dangal) lost to Bajrang Punia (Punjab Royals). 57kgF: Sarita (UP Dangal) lost to Mimi Hristova (Punjab Royals). 86kgM: Irakli Misituri (UP Dangal) lost to Dato Marsagishvili (Punjab Royals). 62kgF: Navjot Kaur (UP Dangal) lost to Anita (Punjab Royals). 74kgM: Jitender (UP Dangal) beat Amit Dhanker (Punjab Royals).